In today’s tough economic environment, many motorists in Kentucky and Ohio are going without car insurance or getting by with only minimum coverage. When one of these drivers hits you and causes serious injuries, where can you get fair compensation for your injuries? The answer in many cases is your own automobile insurance policy, for uninsured (UM) or underinsured motorist (UIM) coverage. UM and UIM claims involve many complex issues such as “stacking”, proving liability, providing notice of settlement with tortfeasors, and other legal issues. Without experienced legal representation, you may be undercompensated or lose the ability to make a claim altogether. Many people are reluctant to make a claim for UM or UIM benefits because they don’t think it is right to make a claim against their own insurer who “didn’t do anything wrong.” This fear misses the point: an Uninsured Motorist or Under Insured Motorist claim is just a demand for your insurance carrier to live up to the terms of the contract it signed with you. You are not claiming they did something wrong, and they will not think you are saying that. Your car insurance company signed the insurance contract with you which said that, if you paid certain premiums, they would provide certain types of coverage. UM and UIM coverage are part of the contract, and under the right circumstances the insurance company has an obligation to pay the same way that you had an obligation to pay your premiums before the accident. Lawrence & Associates has represented clients in car accident cases for many years. 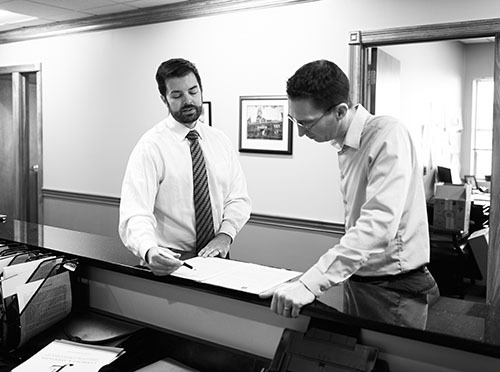 We understand the complexities of insurance coverage issues and work diligently to help each client obtain maximum compensation for their losses. It is important that an attorney gets involved as soon as possible, before you try to litigate with the person at fault for the collision. Particularly where Underinsured Motorist coverage is concerned, you need an experienced attorney to make sure you don’t lose your rights under the policy. Kentucky and Ohio have very different rules about how you notify your auto insurance carrier about litigation and potential settlement with the person at fault for the accident. Also, these two states have different rules about how the premiums you pay for multiple vehicle can “stack” together to provide greater Underinsured Motorist coverage. An attorney who practices personal injury claims “on the side”, or with so many cases that they can’t keep up with all their clients, probably won’t know these rules and may cost you a lot of money. Why Do You Need UM or UIM Coverage? People without these coverages drive at the mercy of the other people on the road, hoping other drivers are fully insured. People with UM and UIM coverage have taken their fate into their own hands and insured there is enough insurance coverage for even catastrophic injuries. Yes, it is more expensive and yes, money is tight. But if you want to know that you have enough insurance coverage to pay for your medical bills and lost wages, getting a policy with high Uninsured and Underinsured Motorist limits is the best way to do so. Anything else is rolling the dice. Why Do Policy Limits Matter? If you have been in an accident with an uninsured or underinsured motorist, contact Lawrence & Associates at (513) 351-5997. We take cases on a contingency basis, meaning you will only owe an attorney fee if we obtain compensation for you. If you win your case, attorney’s fees, court costs, and case expenses will be paid out of the settlement or judgment.